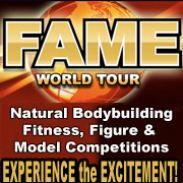 FAME International Championships – Results. * Richard Sequin – Exceptional Physique Award & Super Grandmaster Champion. Richard remembers when he first hit the weights in the furnace room of his parents house as a teenager. Now at 69 years old Richard definitely wowed the crowd! * Silvana Arcila – Exceptional Performance Award. Watch out world! At only 18 years old, Silvana’s FAME Stage debut was a huge success and we’re all anxious to cheer her on as she rises to stardom! We’re thrilled that Silvana and boyfriend Danny Delgado (who also competed and placed a very respectable 2nd runner up in the Fitness Model Novice division) are super charged at this young age to take charge of their lives, train naturally and steer free of the partying lifestyle they were not comfortable with. Thanks to FAME Pro Lucas Irwin for training them and helping them live life body proud! * Michelle LaGasse – Exceptional Performance Award. Each time Michelle stepped out from behind the curtain, the entire stage radiated from her incredible energy making her the FAME International Fitness Model Pro Champion of 2009! Using her exceptional understanding of the categories, Michelle was able to modify her presentation and also won the position of 1st runner up in the Swimsuit Model category! * Amy Barnes and Allen Thompson. Fit Duo Champions. Partners in life and on stage, Amy and Allen, made their FAME Stage debut together grabbing top spots in this routine category. Then they went one step further, competing individually as Muscle Models, nabbing Allen top spots (1st place winner) and marking the realization of Amy’s dream that began 5 years ago when she first became determined to compete. Amy also received a STANDING OVATION once her 300lbs plus weight loss was announced. It didn’t end there…. Amy was then flown out to the Today Show where she announced she is absolutely BODY PROUD! Next up? Multiple television and magazine features to help celebrate her success… Stay tuned! * Claude Pepin – FAME Novice Fitness Model Champion and Muscle Ink Magazine “Body of Art” Award. Yes, ‘Muscle Art”! To honor the athletes who adorned their body – their canvas – with tattoos, FAME together with Muscle Ink, called all athletes to the stage to showcase their muscled body art. Claude Pepin celebrated his victory with girlfriend Sophie Berthiaume, a new FAME Pro as of 1 week ago, who also came out victorious as 1st runner up in the Fitness Model Pro category. * Michael Ferencsik – FAME Pro Bodybuilding Champion. Using his daughter’s music advice, Michael performed a fantastic, unique, entertaining, and very memorable routine showcasing both his personality and his canvas, ie. his chiseled physique. Michael was again in the spotlight when 1st runner up, Ralph Yates, thanked him on stage for guiding him as he prepared for this momentous occasion. Always smiling, Ralph always lights up the stage and this time was no different except that his massive physique came in more fine tuned than ever. It was actually quite uplifting to see both trainer and trainee accept the top two positions! Ralph also grabbed top spots as a Muscle Model coming in as 1st runner up. * Malachi Smith – FAME Bodybuilding Advanced Champion. Malachi had a lot to celebrate this weekend. His physique – with each muscle popping at all times; his fantastic routine – which was well choreographed and showcased his talents and creativity throughout as his swords seemed to extend as part of his body; and most important, his 5 year sobriety celebration! * Tyler Forbes – FAME Novice Bodybuilding Champion. Tyler let us know that this event was life changing for him. He loved every aspect about it, just like the audience and judges loved (the crowd was roaring) every aspect of his physique and entertaining routine. Next up for Tyler? He’s heading out to sea to inspire body proud on a cruise ship. * Bridgette Grosvenor – Muscle Model Pro. Bridgette has exceptional stage presentation and a fantastically sculpted symmetrically balanced physique which makes her a superb representation of a FAME Pro Muscle Model Champion. Not only a champion on stage, Bridgette is also a champion to her children, proving her belief that you can do anything you desire. * Marcela Tribin. FAME Pro Swimsuit Model Champion. Despite nursing an injured foot, Marcela once again used the FAME Stage to shine. She radiated her inner and outer beauty to all those around her, both on stage and offstage. Congratulations Marcela! * Andre Bland – FAME Fitness Model Pro Champion. Although Andre had to modify his changing routine as he lead up to the competition, losing 10lbs of muscle in the process, it was not evident to any of the judges. Andre once again displayed amazing lean muscle tone and had created the same camera frenzy as always does! * Paul Eade. FAME Masters Bodybuilding Champion. Paul has been competing in the FAME World Tour for many years now and continually improves with each show. The FAME International Championships was no different! In fact, Paul also walked away victorious as the 2nd runner up in the Advanced category. On behalf of the Drug Free Sports Association (DFSA), we would like to thank Paul for his generous donation for the Muscles Making a Difference Everywhere campaign. * Colleen Castaneda. FAME Figure Pro Champion. Colleen is motivated by results and after each show asks for specific feedback from the judges so that she can continually fine tune her physique and/or performance. At age 39, Colleen proves that even masters athletes can reign supreme! * Stacey Steele. FAME Fitness Advanced Champion. Recovering alcoholic and ex cocaine user Stacey Steele credits the body proud lifestyle – and World Fitness Association – for changing her life around and making her the shining example and inspirational leader that she now is. * Kala Duncan. FAME Swimsuit Model Champion. The radiant and very bubbly Kala Duncan had reason to smile. And smile she did, all the way across the stage, right toward her 1st place win in the swimsuit model category Her physique, confidence and presentation were exceptional as was her husband, Mitchell’s, inspirational shouts of encouragement. * Amy Rozier. Figure – Physique Champion. This muscle beauty from Mississippi just started training over a year ago with Crystal Green. Redefining a new image of “mom”, motherhood is one of the first things Amy wears on her sleeve (and her themewear apron). Congratulations Amy! * Anita Nicolaou – FAME Figure Posing & Routine Champion. Anita sculpted her physique to perfection and represented Michael Tabban’s Team Australia very well also picking up the trophy (actually a sword) as 1st runner up Muscle Model. * Honnor Moore. Wow! Once again Honnor declared victory when she not only walked to the stage, but actually shone on stage owning it the entire time she was there! And with that she came 1st in Physically Challenged division AND the Masters Fitness Model category! * Yve Shaw. An ex-Gladiator contender from the United Kingdom, Yve came 1st in the Muscle Model Search. Her striking looks, exceptional model type poses and fantastic physique and theme wowed the judges and her beautiful mom, who is now inspired to compete herself as well. Yvette was also the 1st runner up in the Figure Posing & Routine and 2nd runner up Figure Physique. * Jodi Sheafe – Fitness Model Novice Champion. All the way from Australia, 23 year old Jodi’s first competition experience was a huge success, despite her initial nervousness. She presented an exceptional lean, long and toned physique which won her top spots in the Figure Posing & Routine category as well (1st runner up). * Colin Grover – Fitness Model Novice Champion. Colin lost over 70lbs (in just 6-7 months) to get to the FAME Stage and came in grinning and looking phenomenal. He was scouted on the spot and spent most of the weekend living it up and enjoying all the photoshoots that FAME had to offer. We’re sure we’ll be seeing more of Colin and best bud Sheridan Hause at many more events. Sheridan won top spots as the 1st runner up Bodybuilding novice competitor and 2nd runner up in the Fitness Model division. Sheridan was smart and came out modeling his own clothing line to maximize on the exposure opportunity during the themewear round. Ryan John-Baptiste – Muscle Model Champion. All the way from the United Kingdom where he won the FAME UK Championships and became a celebrity featured on TV, Ryan once again set out to impress and impress he did. He was able to taylor his physique for both the Fitness Model and Muscle Model categories and breakdanced his way to victory, also earning himself a 1st runner up position in the Fitness Model Search. Ryan works in the prison as a physical educational officer inspiring body proud to the prisoners who were very impressed with his television debut as a fitness UK superstar. Michelle Greenspan – FAME Power Dance Champion. Michelle has a very inspirational story of triumph despite losing her entire family and being left alone in this world. Instead of feeling sorry for herself, Michelle stepped up to the plate and chose to change her perception on everything to experience all the pleasures that life still had to offer. At that point she chose to live body proud and challenged both her body and her mind. Doing so allowed her to lose weight (she shed 75 lbs) and take the accumulated negative feelings along for the ride. Feeling better, more confident and completely body proud, Michelle is no longer alone and is now married, happy and full of joy! Way to go!!! Suzana Saric. Figure-Physique Novice Champion. Entrepreneur, Suzana definitely knows about perseverance. She had a goal to get in shape and stuck with it despite a broken rib. “You can achieve anything in your life if you push yourself hard enough”. And she did just that, impressing the judges with her physique and earning herself the top spot. She credits her physique success to FAME Pro Ava Cowan. Jane Watts. Figure Posing & Routine Novice Champion. Hailing all the way from Australia as part of Michael Tabban’s team, this is Jane’s first year of competition and “the first time in my life that I can 100% say I love my body and I love the way I feel!”. She even placed as 1st runner up in the Figure Physique / Muscle Model categories as well. With increased confidence and better self image and improved self esteem, Jane now believes that she can do anything she sets her mind on. Congratulations Jane! Shantosh Lafayette. Muscle Model Novice Champion. Shantosh almost didn’t make her plane. We’re sure happy that she did. Her physique and shoulders are phenomenal and her choice of theme wear was fantastic. As the founder of Forever Young Fitness, 29 year old Shantosh is also planning to become a registered dietician so she can help her clients reach their own body proud goals. Her advice? “Keep God the center of your life”. Congratulations Shantosh! Adam Bramski – 21 year old Adam Bramski sure knows how to entertain. He competed as a Fitness Model and choreographed an elaborate, high energy, jaw dropping “book geek-turned-Britney Spears” routine which was just fabulous. Judges loved his energy, creativity and originality and gave him top spots as 1st runner up in the Fitness Model Adavnced category. Lynette Fidel – Swimsuit Model 1st Runner up! Lynette is a 33 year old naturopathic doctor who was thrilled to be on stage 12 pounds heavier since being persistent with her training. “Results do happen, but not overnight”. Plus, results are not just in physical appearance, but also how you feel. Lynette, herself, feels more confident than ever – in all areas of her life! Melanie Reynolds – Lving with a physical disability for many years did not stop Melanie from reaching her dreams to compete. Eight years later that dream came true and Melanie hit the stage, although she no longer views it as ‘competing’, rather she is ’simply showing the world just what she is capable of!’. Her new dreams are to inspire people to live body proud and follow their dreams. “If I inspire just one person, I have succeeded as an athlete”. Congratulations Melanie, you have succeeded! 🙂 Melanie nabbed top spots in both novice Figure categories (1st runner up Figure Physique // 2nd runner up Figure Posing & Routine)! Amanda Robles – 25 year old mom, student and personal trainer, Amanda rose to victory in her very first show (it has been her goal to compete for hte last 7 years) and took home the trophy as 1st runner up in the novice Fitness Model Search. We first met Amanda at a FAME Camp earlier this year and we were thrilled to see she took good notes and excelled on stage. Her physique was top notch as was her confidence, style and grace. Olga Fernandez – 38 year old elementary school teacher, Olga Fernandez, once again came in victorious in the Masters Fitness Model competition. No stranger to the FAME Stage, Olga has actually been competing in this show every year for the last 4 years, reclaiming her position as 1st runner up just like she did back in 2007. Olga is self trained and credits being body proud as helping her reach her goals and boost her confidence. Teresa Juried – 2nd runner up Swimsuit Model Search. Teresa, also known as TJay, is a 31 year old bankruptcy paralegal who is now body proud and feeling better than ever. “I am happier, healthier, and have amazing energy”. The FAME International Championships marked her debut to the competition circuit and what a debut it was… She looked fantastic and appeared at ease at all times (wow!). Congratulations! Jason Hicks – 2nd runner up Muscle Model Advanced winner. At age 30, Jason used the FAME stage to showcase his fantastic muscled physique which he credits to hard work and sacrifices he had made over the last few years. His recipe for success? “A consistently healthy lifestyle coupled with determination”… Well, it works! Congratulations Jason! Emily Marshall – Celebrating her 35th birthday, Emily had to leave early to attend her own party! Well, she gave herself a great gift, the 3rd place win as a novice Fitness Model! Emily is also a mother of 3 who lives body proud to inspire her children. A side bonus? “I feel I am currently in the best shape of my life”. She credits this to hard work, dedication and newfound confidence. Vahana Dorcis -Congratulations to web developer / personal trainer, Vahana who won top spots in the novice Bodybuilding category (2nd runner up!). Vahana’s most proud moment was his first ever competition which he said “was ackward but I did it and I am still doing it”. Why compete? “It helps to be in shape to inspire my clients to do the same”. Great work Vahana and trainer, Spencer Tilmon. Catalina Castro – Losing over 40 pounds, 21 year old student, Catalina, from Colombia, feels happy and healthy for the first time. For this reason, the FAME Stage means so much more to her than just a competitive arena. It’s a brand new life; the emergence of a new person; the accomplishment of a dream. “Being Body Proud is a my dream come true!” Congratulations Catalina. You looked beautiful and rocked the stage! Beth Snyder – At 50 years old, Beth impressed everyone when she hit the FAME Stage in the Figure Physique masters category. In her own words “who says you can’t have a hot body at 50?” Well, after seeing your performance,… ‘no one!”. Beth maintains this body proud lifestyle as part of her anti-aging strategy. In the process her confidence level has soared! She has also inspired many others who have been witness to her amazing transformation and hopes to continue that trend. Congratulations! Michelle Correa – At only 17 years old, Michelle is a true inspiration. She hit the FAME Stage after deciding to “trust in myself, give it everything I have, fight for what I want and be completely dedicated”. She did just that and looked absolutely beautiful. Congratulations Michelle! We’re so happy that you have chosen to do this and that you now feel more confident and body proud. You are capable of doing anything you want! Great work! Annie Masi. 34 year old Annie Masi’s passion for health and fitness lead her to be body proud and a FAME Swimsuit Model. She feels she is now a better person because of this new lifestyle and is thrilled that she became more knowledgeable about nutrition, exercise and overall health in the process. Her advice? It’s a great one.. “Live, Laugh and Love”. Julie Perez – Now here’s a SUCCESS Story! Two years ago, Julie was hit by a drunk driver and left in a coma. Doctors did not expect her to recover as well as she did and actually only predicted a 3% chance of survival. She experienced paralysis and brain damage and actually had to relearn just about everything. Flash forward to Sat Nov 7 2009… Julie is now body proud, in the best shape of her life and a FAME Swimsuit Model!!! Although it was her first time in heels and her knees were a little stiff, Julie still rocked the stage!!! Congratulations!! “Being Body Proud has helped me overcome my injuries and surpass all of the doctors expectations. I am at an all time high. Just believe in yourself. Work towards your goal day by day and you will see results. Keep a positive attitude in mind, body and spirit.” Trust her, she’s walking proof it works!